Initially, I'm struck by a feeling of the lullaby. It might be the sound of crystals, but it's also reminiscent of music boxes. This emotion has been a theme I've noticed in these two Erang albums, one which I feel is rarely so openly confronted in dungeon synth, though always present, which is that of innocence. Often it is through the naiveté or youth of the artist, however in Erang's case I sense a definite self-conscious element to these choices, which is why it is able to be so up-front with its exploration of the fragile weakness of nostalgia, rather than shielding it in dissonance or putting the focus purely on the fantasy. 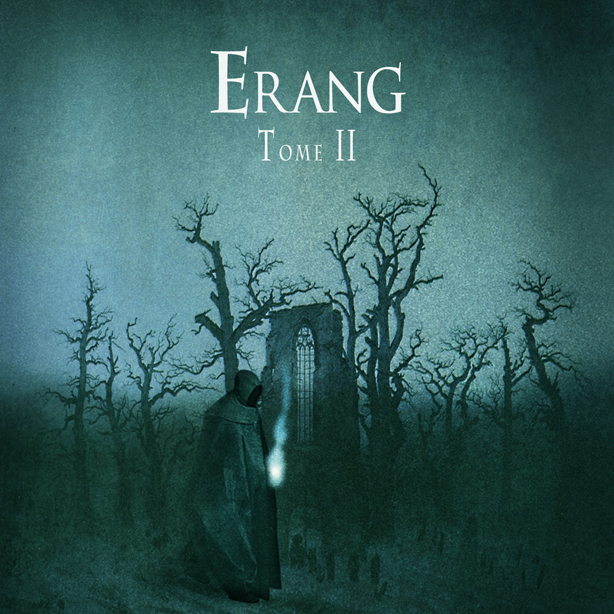 In that way, when it comes to expressing the emotional qualities behind dungeon synth, I feel that Erang is one of the most honest artists. When we get to tracks such as "The Road Goes Ever On," we hear a sad farewell to things past, though with the feeling of a happy acceptance of the ongoing nature of life. It is very reminiscent to me of when Bilbo makes his journey to Rivendell in the Fellowship of the Ring, not intending to ever return. It is a full and beautiful understanding that one has to let the past go in order to truly move forward, though with a smile and a tear in the eye, as one looks back for a final time before proceeding onward into the next phase of one's saga. My favorite track on the album is "People of the Crystal Cave." This might just be my own personal enjoyment of the whimsical, but there is something purely magic about this track. It seems very fey-like, having both the majesty and silliness of elfland. It is clear that Erang has a love for the old synthesizer tones, and is eager to explore them with a respectful ear. It might seem a strange parallel to draw, but I often feel similar moods as to when I listen to Boards of Canada. It might lie on a completely different spectrum in terms of style, but the mood I find is often on the same thread. By this I mean that both manage to tap into a certain feeling which seems, in my opinion, to come natural to the synthesizer as an instrument, and that is the vague sense of beautiful memory, a sort of bittersweet nostalgia; this specific feeling isn't found merely in composition, but in a way that could only really be expressed with certain sounds of the synth. A more specific point I'd like to mention in regard to the textures and recording style is that there is something quite striking about the end of "Ruins of a Lost Underwater Kingdom." I don't know whether that was a mistake that was kept due to its peculiar effect, or an intentional trick, but it sounds gorgeous, absolutely fitting the mood of the track and the idea of its name. Erang descends in and out of the darkness at various points in this album, as he did in the last. reaffirming the point that things will not end well, that despite the beautiful moments in this world, we all meet the darkness eventually, the one that sits behind each and every one of us constantly, whether we choose to acknowledge it or not. In Erang's choice to do so, however, he explores the full landscape of the fantasy, giving us a powerful contrast, increasing the intensity and understanding of all the various realms. I'd say the weakest track on the album is "Dancing with an Evil Soul." It seems somewhat out of place and distracting. I compare it to "Wood's Lullaby" in the previous album, just not quite resonating with me or causing my imagination to be piqued. Overall, it's a subtle and surprisingly powerful album. Erang is an interesting artist, whose works seem to sound slightly better every time I hear them. I hope you all will incorporate his albums into your regular listening schedule, because I think you'll find them quite rewarding. Though I would not go so far as to call Tome II a masterpiece of the genre, I will still give it an asterisk in the list, to say that I both love it and that it represents the epitome of the dungeon synth sound, while still being very much unique and exploring uncharted territory. I hope that Erang continues with his work, and continues to reach into those obscure and nostalgic atmospheres. "Subtle and surprisingly powerful" is a perfect descriptor for this album. Erang does a great job of taking the feeling and sound of dungeon synth and creating something distinctly unique with it. 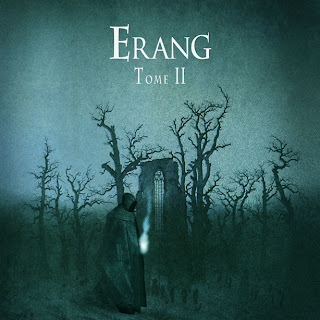 I feel that, especially on this album, Erang has also been incorporating more traditional or contemporary ambient soundscapes in a manner that makes them totally appropriate to the dungeon synth feeling, although, heavy on the nostalgia and generally lighter on the dread, which is fine by me. 'Ruins of a Lost Underwater Kingdom' for example has a Brian Eno (Discrete Music, in particular) feel to it, while the artificial harp and what sounds like a warped record or wheezing music box at the end hearkens to projects like Boards of Canada, or even more obscure artists like Plinth. That's not to suggest that any of those artists were direct influences at all; the connection only serves to hint at some of the talent lurking behind the Erang name. Great review for a great album, Andrew. Hey Jake, thanks for the feedback. I think you're spot-on about the Eno reference, but I'm not familiar with Plinth. It's pretty peculiar how it seems to sort of recall familiar moods without directly referencing them. To be completely honest, the astonishing quality of albums like this one are making me a bit overwhelmed with how genuine and alive dungeon synth is right now, and that's considering the third Erang album is already out (and also great).